To change the chain from cog to cog on the cassette at the rear of your bike, you need a rear derailleur. The rear derailleur is the hardest working component of your bike. So, you need to ensure if it is compatible with the other parts of your bike. As you are searching for the best rear derailleur, the question is which one is the best? We aim to bring the best gear at your fingertip. This article will help you find the best rear derailleur available in the market today! A rear derailleur is the fundamental part of your bike. So, what should we consider before buying the best rear derailleur? You should consider the cage length, drivetrain capacity, material, price, etc. when you are in the market. The simple strategy is; if you have a Shimano Shifter than you need a Shimano rear derailleur and similarly with the other brands. Here, our experts have discussed ten best rear derailleurs with their pros and cons to help you find the best one. Let’s read and find the best one! 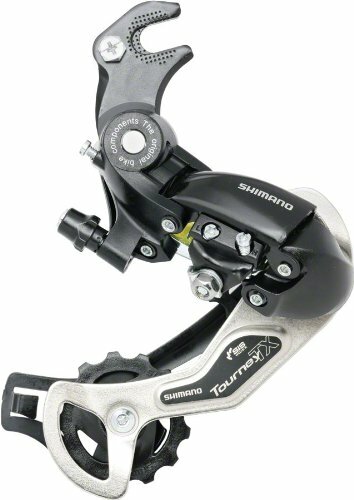 Shimano XT RD-M8000 Rear Derailleur is one of the most compatible rear derailleurs nowadays. It is easy to adjust chain stabilizer and its new shadow design which is optimized slant that helps keep the chain in a stable position. You can shift your bike gear easily without giving much effort. It needs 20% less effort to change gear than a traditional derailleur. This nice derailleur is backward-compatible. It can be used a road bike, mountain bike, and fat bike with any cassette with any configuration. It helps to shift gear from 1 to 11 smoothly when you are using 1×11 setup without dropping the chain. The aluminum made rear derailleur is compatible with the latest HG-X 11-speed chain which is more efficient, silent and needs less maintenance. It is made with sealed bearing in its pulley which provides smooth and reliable movement of the pulley without any noise and keeps safe itself from any dust. The pulley has 11 strong teeth, and all the teeth are capable of holding the chain tight enough and give you a smooth pedaling. Its cable adjusting barrel is very friendly and quiet that you can shift your chain more efficiently. It is one-by, two-by and three-by -11 compatible. 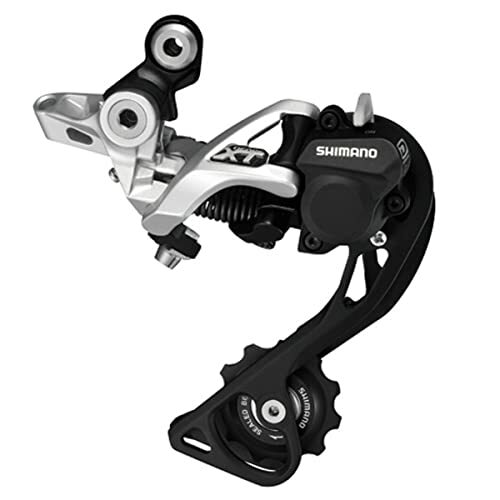 If you are looking for a 9 speed compatible (Compatible with all Shimano 9-speed HG cassettes, 9-speed mountain shifters, and 9-speed chains) rear derailleur, then Shimano Deore XT Shadow Mountain Bicycle Rear Derailleur – RD-M772 is one of the best options for you. It is made with including a feature to use in the mountain, cross-country, and trekking mountain bike. This aluminum made rear derailleur is made for long cage teeth so that there is no option to drop chain. As it is made single tension construction that prevents the derailleur from hitting the chain on rough terrain, and direct routing reduces snags. This RD-M772 shifts very quickly and accurately every time without dropping the chain. It runs very smooth, quiet and it supports the chain very nicely. If you are a biker and you need to shift your chain often, then it will do it without any problem. It’s a lightweight and direct mount. Another feature of the derailleur includes max large sprocket is 36, min large sprocket is 32, min teeth small sprocket is 11 and the total capacity is 45T. It’ll keep the chain tight enough for both small and large cog so that you will get a smooth riding. 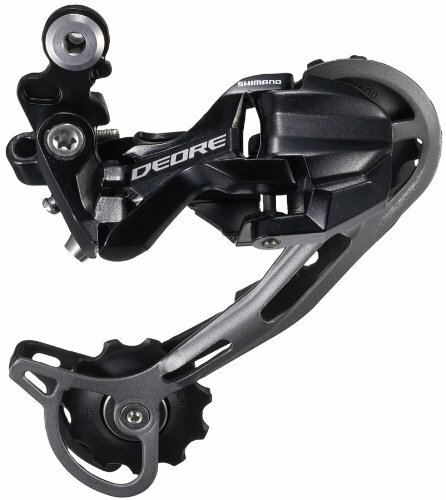 Shimano Deore 9-Speed Mountain Bicycle Rear Derailleur – RD-M591 is made with highly durable, reliable with double-servo Penta mechanism and is tough. If you are looking for a rear derailleur for your mountain bike, then it may be the best choice for you. Its wide link design rises its solidity and durability. It is made with alloy and steel which made it lightweight without decreasing its strength and durability. Its versatile design works nicely both in off and on the road so that you can use it not only on the mountain but also on cross-country, on and off-road. This latest rear derailleur is compatible with 9-speed technology that means you can use it a 9-speed chain, 9-speed HG-cassettes, and 9-speed shifter. It’s excellent quiet and quick shifting technology can shift your chain cog to cog often without any hesitation. The pulley has 11 teeth and mounts with a sealed bearing. It is 28-34 low sprocket compatible and capable of 45T. You can you maximum 34T cog to use it and consistent with the long cage so that you can use it with a triple chainring. It helps to keep the chain in over the cassette tightly. The new Shimano Deore XT RD-M786 SGS Shadow Plus Rear Derailleur is made with stabilizer switch which helps to reduces the chain slapping is one of the best rear derailleurs for a mountain biker. It is compatible with 10-speed technology can be used with ten speed HG cassettes, 10-speed chain, and 10-speed shifter. You can shift your chain from cog to cog easily and quickly even you need to do it often. You also don’t need to worry about the chain dropping while moving because it keeps the chain tight enough. There is no snagging from any trail due to its direct cable routing compatible. This alloy and steel made Deore XT RD-M786 SGS derailleur leads lightweight compromising durability, strength, and quality. Durable and smooth steal bearing mounted two pulleys provides a very comfortable pedaling. Compatible with a long cage gives an opportunity to use triple chain ring although it is capable of maximum 35 cog teeth. Extensive link construction increases its solidity and durability. As it is backward compatible so you will feel positive while shifting the chain. The derailleur has a high cable pull ratio that provides a more accurate shift action and makes the system less prone to combine. 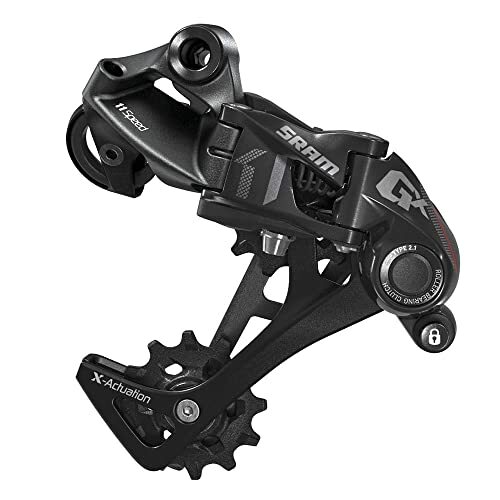 SRAM GX Bicycle Rear Derailleur with 1 x 11 Speed Long Cage rear derailleur is one of the best derailleurs for a mountain bike although it is made for a mountain bike, it can be used in a crossroad, on and off the road too. As it is long cage compatible derailleur so it can be used in on your triple chainring bike. It is made with x horizon technology which reduces the shift force and ghost shifting prevent the chain from slapping. Its upper pulley is a little bit large and its offset adjusted with the chain gap automatically. The SRAM rear derailleur is work nicely if your bike has about 50T cassette. Its long cage compatibility also prevents drop chain problem. Its pulley is mounted with a sealed bearing which is more durable and smooth for pedaling. Although it is one by eleven speed compatible and can be used a large cassette with maximum 50T, you can shift your chain accurately from a cog to another cog. Its direct cable routing provides the less snugging facility. Its handy cage lockout design provides to lockout the derailleur easily while installing and need to remove. Including all of the feature, the derailleur is lightweight. 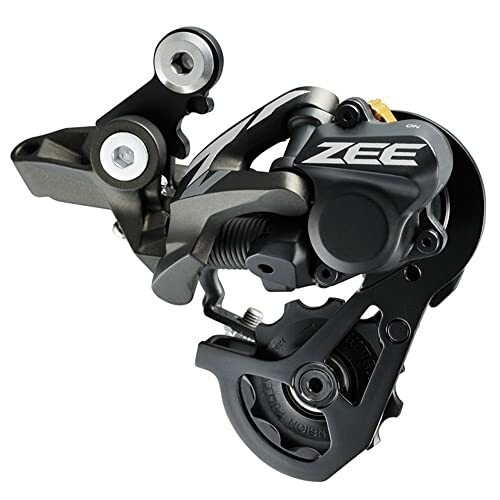 SHIMANO RD-M640 Zee Shadow Plus 10 Speed Rear Derailleur is one of the most popular rear derailleurs of today’s biker. It is made with shadow plus technology with low profile design with built-in chain stabilizer that reduces chain slap alongside drop and impact noise. It is compatible with 10speed that means you can use it with 10-speed chain, 10speed hg cassette, and 10-speed shifter. Its 10-speed gear mechanism has a low profile that neatly folds the short cage safely below the cassettes cog. Its short cage is excellent for avoiding hits in the rock garden. The Shimano RD-M640 Zee is made of aluminum that makes it lightweight compromising its durability, strength, and quality. It is also made with sealed bearing technology in its pulley that increases its durability, and the offset of the pulley wheel adjusted automatically with the chain gap. The two pulleys keep the chain tight enough whether the chain is in a small cog or its large cog and help the chain to adjust with cog teeth. You can change your bicycle gear simultaneously from cog to cog without worrying about chain drop. Its total capacity is 25T and compatible with Dyna-sys. 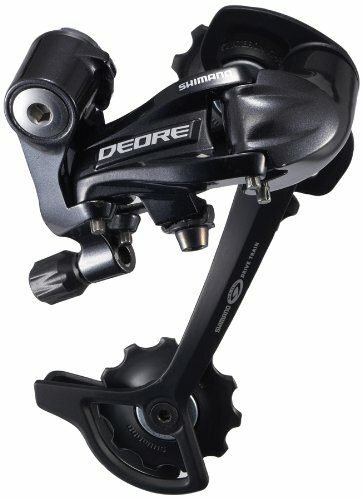 Including 9-speed compatible, Shimano Deore RD-M592 rear derailleur is one of the best rear derailleurs for mountain biking. It is compatible with 9-speed hg chain, 9-speed shifter, and 9-speed cassette. Its wide link shadow design mechanism increases its durability and solidity. As it is made of aluminum so that it is lightweight but strong and durable. It is made of with super low-profile mechanism that decreases the risk of damage from trail side hazard. Integrated single tension spring which prevents contact with chainstay that results in a quiet ride. Its direct cable routing also prevents snagging from any trail side hazards. This Deore RD-592 has two large 11 tooth pulley’s and both of them are automatically adjustable to chain gap. Both pulleys are mounted with a sealed bearing which makes the pulley durable, smooth and reliable to pedaling. Although it is made with 9 speed compatible you can use it with your triple chainring because it is made with long cage consistent. You can shift your chain simultaneously while riding without worrying about chain drop. It will shift the chain cog to cog accurately every time. It is capable of maximum 45T so that you can use it for a large cassette. 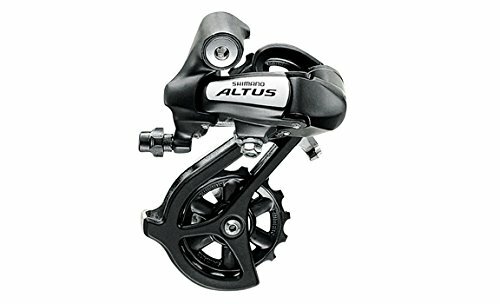 Shimano Altus Mountain Bike Rear Derailleur – Direct Mount – RDM310 is a traditional rear derailleur which is a good option for who is thinking about to change his bike rear derailleur of their mountain bike. Its color is black and it is lightweight. It is compatible with an 8-speed mechanism that means you can use it with Shimano hg-x 8 speed chain, 8-speed cassette, and 8-speed gear shifter. It is capable of maximum 34 teeth cog and provides one by 8 speed. Its wide link design mechanism provides durability and precise shifting. It is one of the best derailleurs with at a low price. Shimano Altus Derailleur can be mounted directly. The nice derailleur provides smooth shifting, so you can shift your bike chain from cog to cog easily quickly and accurately. It has two large two pulleys, and both of the pulley’s offset is adjusted with the chain gap automatically. Pulleys are mounted with the derailleur by a sealed bearing which makes the derailleur pulleys faster and smooth. It is long cage compatible rear derailleur that can be used in for the triple chainring. The shifting chain can be done quickly and smoothly without worrying about chain drop, and its cable mounting mechanism prevents chain slapping. 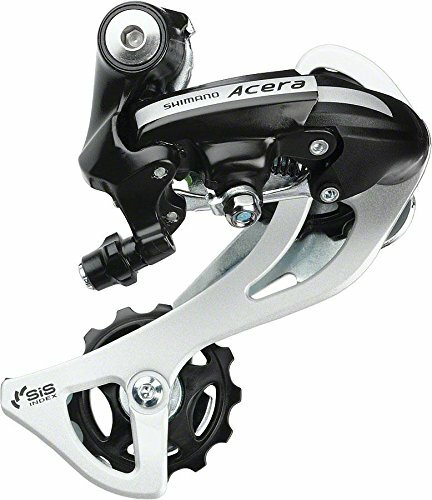 Shimano Acera Mountain Bike Rear Derailleur is one the cheap and smooth derailleur with smart cage mechanism is the best rear derailleur for a mountain biker. It is compatible with a long cage that defines you can use it with triple chainring easily, and it works smoothly. Its standard top design provides the derailleur to control hard gear shifting smoothly without forcing. If you want to shift your chain often then it will do it accurately without dropping and slapping the chain. Its direct cable mount mechanism prevents snagging from any trail side hazards, and it also prevents chain slap. 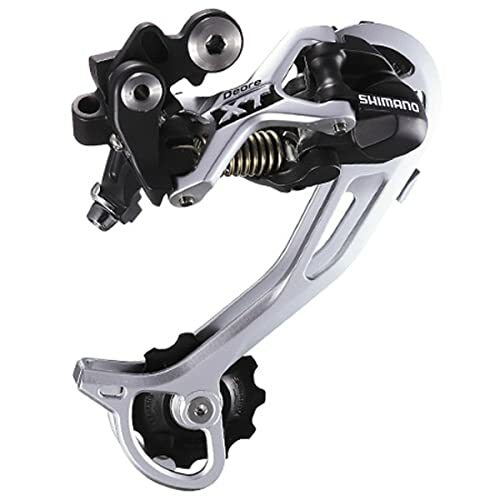 This Shimano rear derailleur made of aluminum and steel construction that makes the derailleur lightweight compromising its strength and durability and provide silent biking on the mountain. It is compatible with 13 teeth sealed bearing pulley and the offset of the pulley automatically adjusted with the chain gap silently while you need to shift chain. Its single tension spring provides a quiet ride by preventing the contact with the chainstay. Its direct mount cable system prevents chain slap and snagging from any trail side hazard. Its low friction link pivots bushing provides a better shifting response and reduce the chain drop. 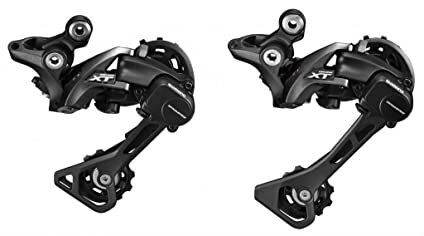 If you are looking for regular mounted cheap but durable rear derailleur for your mountain bike then Tourney Shimano Rear Derailleur RD-TX35 is one them. This Shimano tourney series derailleur is compatible for 6 or 7-speed chain, shifter, and cassette. It especially makes for a mountain bike as more durable, and you can use it to your road bike, hybrid/comfort bike, urban bike, fixed gear bike, and event kids and fold bike too. It needs to be mounted with your bike conventionally. It is also compatible with a wide range of gears and a maximum of 34 teeth sprocket. Shimano Tourney has 13 teeth pulley that’s offsets are automatically adjustable with the chain gap. Its single tension spring prevents contact with chain stay and provides a quiet ride. You can shift your bike chain cog to cog often without any chain drop, accurately and silently. Any kinds of chain snagging and its direct mount cable routing mechanism prevents chain slap. It is compatible with triple chainring by its long cage mechanism, and its smart cage system provides mega range compatibility. Its cage is made of aluminum which makes its lightweight, durable and robust. A smooth and accurate gear shift possible by the derailleur silently. We hope, you have already made your decision. For smooth shifting, you need the best rear derailleur. Considering all the features and price, our experts suggested the above-mentioned rear derailleur. We always try to bring the best product in front of you, and this article is no exception. Whether you want to ride on the rough mountain trails or want to climb a little quicker, any of these best rear derailleurs will help you!